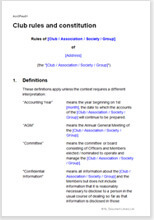 This is the perfect constitution for your club or association or society. It covers all your basic requirements very thoroughly. It sets out the constitution and rules in a sensible, practical way with notes of advice too. Needs no legal expert support and no registration. Just go with it. This is a constitution or set of rules to regulate your management of any straight forward club or association or other organisation. It is not suitable for a not-for-profit organisation, a co-operative society or any organisation that may want to register as a charity later. Whether your club is new or has existed for years, you have a simple choice of how to frame it. Most simply, either it will be an unincorporated body or you form a company and put it there. If you use a company, you are probably best with a company limited by guarantee. So your question is “Do I need a company or shall I leave it unincorporated and regulated by the constitution we want to decide on”. A really useful article is at Chose the Best Structure for Your Club or Association. If you choose an unincorporated association, you have one further choice. You can either obtain corporate status under state law, for example, the Associations Incorporation Act 2009 of New South Wales, OR you can remain as a simple group or club as an unincorporated “body”. If you want incorporation, your state incorporations act administers your affairs in much the same way as the Australia Corporations Act, but with a far lighter touch. But of course there are obligations and restrictions. If you are not concerned about the benefits of incorporation - usually because your activities have little or no business face, then here is your template. Of course you want to be sure that the constitution covers everything you needs but does not go over the top in an unnecessarily long document. We have a good, short article on what should be in your constitution and why, at How to Manage your Club or Association. Net Lawman sells several templates for clubs and so on. This is a simple and general version. Here is the selection if you might want to something a little more specific. "Net Lawman's legal templates are always our first option when approaching new risk management initiatives for both clients & ourselves; because paying over priced fees for lawyers to create standard documents is now an outdated process. We have successfully prevented many risks before they occur via the use of Net Lawman's templates for; NDA / Confidentiality, Cyber Risk, Media Release, Sales/Supplier Contracts and many others. If you like saving money without reducing quality, then use Net Lawman"
"Great site, so effective, gives you what you need when you need it, no waiting around."